My mom didn’t cook cabbage stew as we were children and I discovered it only a few months back myself. I loved it and keep making it since. As Renate from kreativlink just asked for an easy recipe for cabbage, I thought it is a good time to put my recipe online. 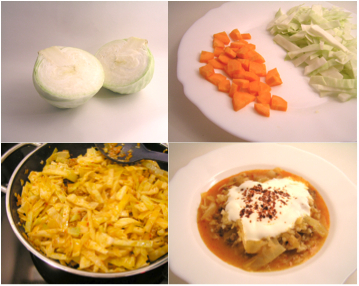 Cut the cabbage into slices and the carrot into cubes. Put everything together in a pan and cover with water. Let it come to a boil, add salt. Reduce the heat and cook … well … till it is cooked. Serve with yoghurt and chilli on top. Bon appetite !! I was to hungry and already started my “cabbages stew”. Have bacon instead of meat and some onions and potatoes instead of carrots but well, just hope it will taste good still. In the last few years there’s been some kind of soup/stew revival, at least in my family. Every week I am forced to try some new ‘creation’ by my mother or grandmother. They are usually quite good!